The NEC EA294WMI-BK is a 29” LED-Backlit desktop monitor provided with integrated speakers. With IPS (in-plane switching) technology you benefit from an enhanced 2560 x 1080 resolution along with 178° vertical and horizontal viewing angles with a 6ms response time. The display is provided with a variety of connectors including DisplayPort, HDMI, DVI-D single-link, DVI-D dual link, and VGA inputs. The EA294WMI-BK features Smart sensing technology that automatically detects your work conditions to determine proper display brightness with ambient light sensor. 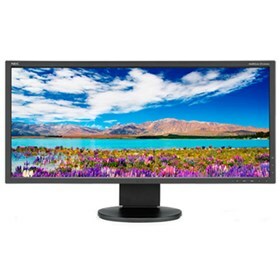 This monitor has brightness of 300cd/m2 with 1,000:1 contrast ratio. The NEC EA294WMI-BK has many exciting features for users of all types. See the NEC EA294WMI-BK gallery images above for more product views. The NEC EA294WMI-BK is sold as a Brand New Unopened Item.